Curt Christensen was born on March 30, 1937 in Pipestone, Minnesota to Fred and Merle Martinsen Christensen. The family made their home in Ruthton, MN until 1943 when they moved to Slayton, MN. Curt graduated from Slayton High School in 1955 and then attended Gustavus Adolphus College in St. Peter, MN graduating with a Business Degree. Curt was a member of the Minnesota National Guards and served as an ambulance driver. Curt farmed and raised cattle while working at John Deere with his mother, Merle. In 1957 he and his brother, Fred purchased the dealership. On December 2, 1961 he and Audrey Beech were married at Christ Lutheran Church in Slayton, MN. Curt received a patent in the early 1960’s for his Doormaid product, which were produced in Slayton and sold nation wide. In 1971 he and Audrey divorced and Curt moved to Keeley Island on Lake Shetek. In 1975 he and Marilyn Monson were married in Las Vegas, NV. They continued to make their home on Keeley Island. Curt operated John Deere until 1981. Curt then owned and operated GMA Amusement and also a bar in Sibley, IA called the Cowboy Club. He and Marilyn divorced in 1985 and Curt moved to Hawaii for 5 years and worked at Vacation National selling timeshares. In 1992 he returned to Keeley Island. Curt spent two winters in California before making McAllen, Texas his second home. Curt passed away on Tuesday, May 29, 2018 at Amara Hospice in Edinburg, TX at the age of 81. He was the longest living resident on Keeley Island. 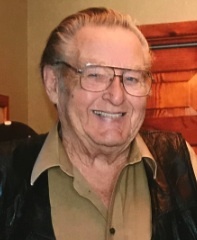 He was a member of Christ Lutheran Church in Slayton. Curt was a member of the Jaycee serving as President from 1963 to 1967, a member of the Chamber of Commerce, the American Legion, and the Kiwanis Club. Curt enjoyed spending time with his family, golfing, western movies and cribbage. Curt loved an adventure whether it was traveling to visit family and friends, taking the grandkids out on the boat or just meeting new people from across the country. Survivors include his three children Kim Marie Christensen Johnson of Slayton, MN, Craig Christensen and his wife, Dawn of Slayton, MN, and Brett Christensen of St. Peter, MN, two step children, Kim Reed and her husband, Bart of Eden Prairie, MN and Scott Biesemeier of Rushmore, MN, six grandchildren, Kyle, Colton, and Cameron Johnson, Macy and Colin Christensen, and Nichole Christensen and Shane Beitbarth, six step-grandchildren, Lexi, Julia and Ryan Reed, Anthony Lumsden, Katanna Biesemeier, and Darby Biesemeier and Lucky Sayveo, and four step-great-grandchildren. He is preceded in death by his parents, infant sister, Marion June Christensen, two sisters, Delores Porter and Marilyn Staples and one brother, Fred J. Christensen. Christ Lutheran Church in Slayton, MN on Monday, June 11, 2018 at 10:30 a.m. with Rev. Dawn Quame officiating. The organist is Brenda Whitehead with special music by Heidi Winter. Interment is at Slayton Memorial Gardens in Slayton, MN.